Great Travel Finds (GTF) Broadcast.
. . . Morocco is a North African coastal country about the size of California. The geography of the country includes a great expanse of Atlantic coastline as well as desert, mountains and plains. The scenery of Morocco is a blend of the African continent, while its monuments reflect the rich and varied traditions of the Islamic civilization which began its influence in the year 710. Morocco is bounded by two seas, a mountain chain, and the immensity of the Sahara Desert, yet it is Europe’s nearest neighbour and the most accessible of the Maghreb countries to visit. Throughout its three-thousand year history, Morocco has been the most open to the crosscurrents of other civilizations from the North to the South. Morocco presents a wonderful variety of geological wonders. The countryside is beautiful, running along both the Atlantic and Mediterranean coasts. Just eight miles from Spain, Morocco might have lost its soul to Europe – but refused. Though conquered by Rome and colonized by Spain and France, Moroccans held fast to their Berber culture, while adopting the Islam religion brought by the Arabs from the East. 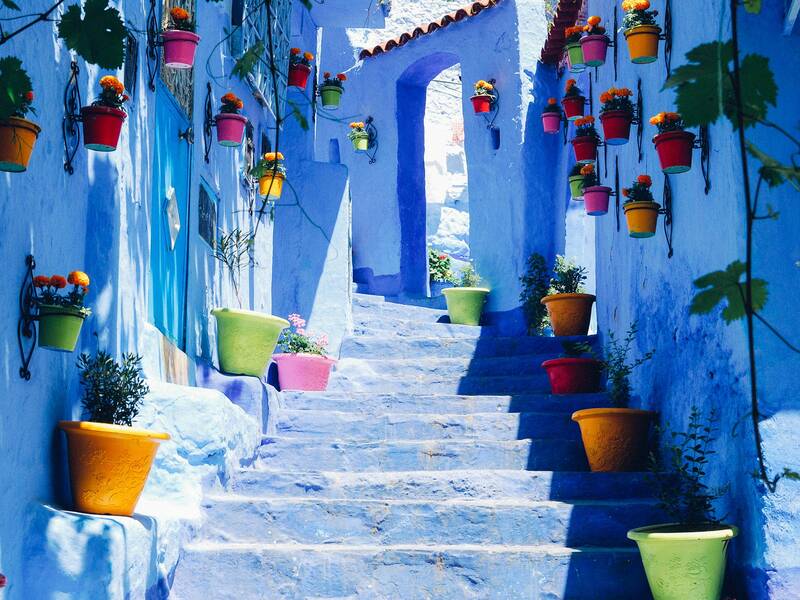 Morocco is an ancient country molded by three thousand years of history. As a result of its unique geographical position, Morocco has been exposed to the religious, artistic and economic cross currents of the East, Europe and the depths of Africa. Many countries have, at various times, attempted to take over Morocco for their own interests. I will mention the most recent colonization in Morocco’s history which covers the period of the French presence from 1912 to 1956. The French built roads and railways developed the port of Casablanca and moved the political capitol to Rabat. During that era, many Europeans settled in Morocco. By the end of World War II, strong nationalist sentiment grew and was supported by the Sultan. In 1955 the French withdrew from Morocco and the Sultan’s son, Hassan II, became King. A constitution was established in 1972, which allows the many regional areas of the country to represent the interests of the people. There is so much more to Morocco than words can tell, so let’s begin our journey. . . 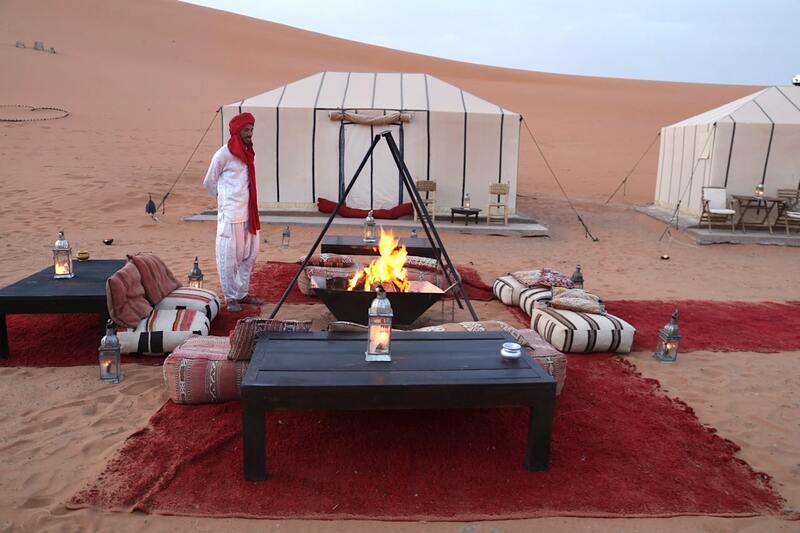 Welcome to exotic and enchanting Morocco. Upon arrival in Casablanca, we’ll be warmly greeted and transferred to Casablanca’s corniche of Ain Diab. A continental breakfast will be served at a terrace of a café overlooking the ocean. 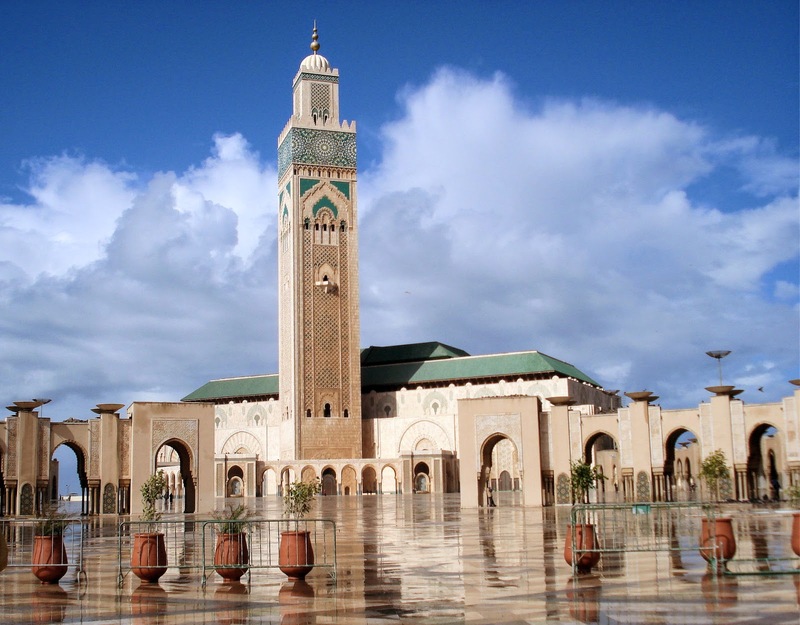 After breakfast, we’ll have a visit to the nearby Hassan II Mosque, an architectural wonder and the largest on the continent of Africa! After the visit, we depart to our hotel for check-in. Casablanca is propelling Morocco towards the future with energy, determination and an infectious optimism. Architects began designing this model city in 1912, bringing a visionary charm to this modern metropolis. 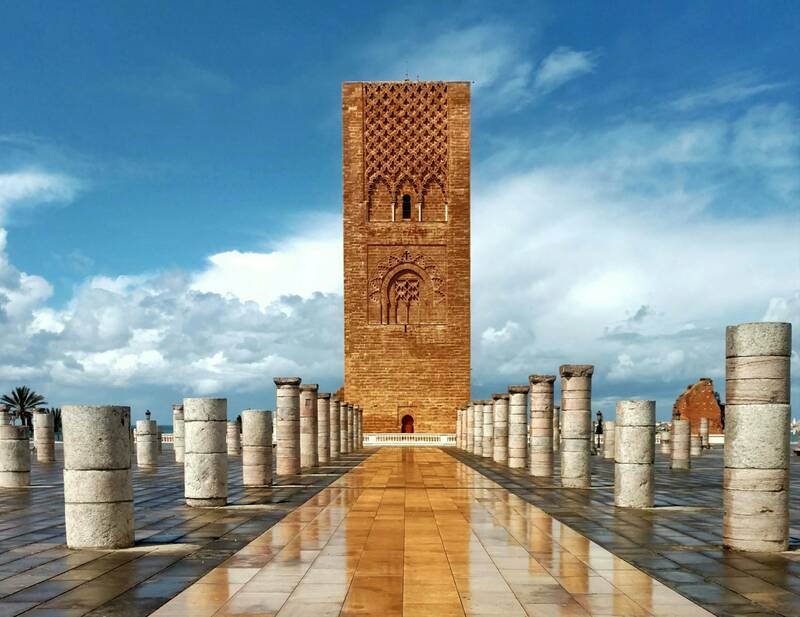 Being the largest city in Northern Africa and stunning for its architectural beauty, it was no surprise that the city was chosen to be the site of the monument designed to mark the end of the century and an entire nation’s dream — the Hassan II Mosque. Casablanca is where the international business dealing takes place, where luxury goods and services flourish, high-tech industries are concentrated, and top quality hotels host world-class conventions and congress, all making her the shining light of modern Morocco. Since Casablanca has no natural harbour, the fantastic 3180 metre long Moulay Youssef Jetty was constructed to create Morocco’s premier port and the fourth largest in Africa. Lunch is on own account. Morning city sightseeing of Casablanca including the Habous Quarters, the Royal Palace Gate, the Mahakma and the United Nations Square. Early afternoon transfer to the train station in time to board our train to Marrakech scheduled at 2:55pm arriving Marrakech at around 7:00pm. A pre-packed snack and a beverage will be served on the train. 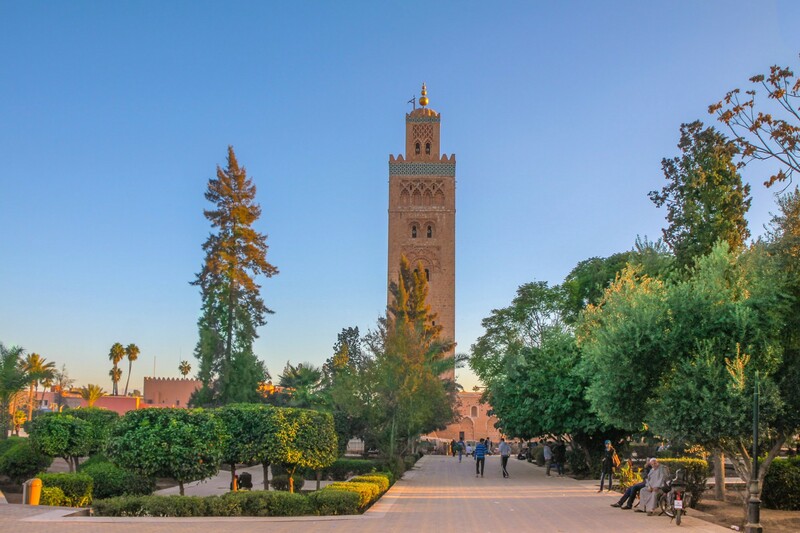 Founded in 1062 by Youssef Ben Tachefine, the first Almoravide sovereign who made southern tribes submit to his authority, Marrakech is one of the Imperial cities of the kingdom (with Rabat, Fes and Meknes) and the most picturesque : the pearl of the south. Nestled in the heart of acres of lush palm groves (around thirteen thousand hectares) and surrounded by the majestic snow-topped mountains of the High Atlas, Marrakech has always preserved the hallmark of its originality. Marrakech is a combination of two different and complementary cities: Gueliz, modern quarter with a distinct European flavour and the traditional Medina. Marrakech, the red city, rich in arts and history seems to have been built for the sole enchantment of the tourist. After breakfast at the hotel begin a full day of sightseeing. Lunch included, will be in a Moroccan restaurant in the Medina. Visit the beautiful Menara Gardens, the Old Medina, and a close view of the famous Koutoubia Minaret. The Bahia Palace with its lush Moorish-style Gardens dates from the reign of Moulay al-Hassan, when it was built as the residence of the grand vizier, Sidi Ahmed Ben Musa. The nearby Palais Dar Si Said is the Museum of Moroccan Arts. Adjacent to the Kasbah Mosque are the Saadien Tombs. This afternoon visit the famous Djemaa El Fna Square and the souks located in the Old City. Other than the souks, this is where everything happens and it is at its liveliest in the late afternoon. Rows of open-air food stalls are set up and mouth-watering aromas fill the air. Jugglers, storytellers, snake charmers, magicians, acrobats and benign lunatics take over the rest of the space! 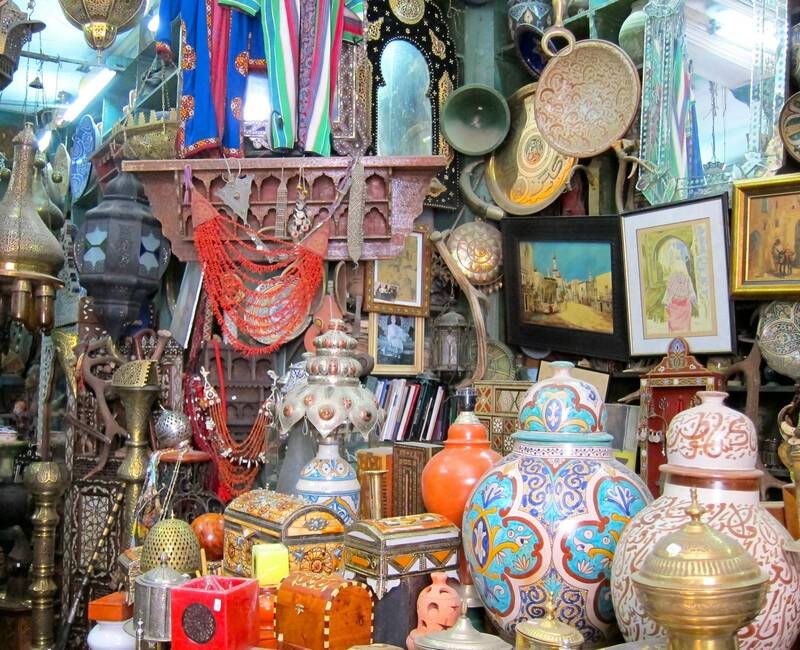 The souks of Marrakech are some of the best in Morocco, producing a wide variety of high-quality crafts. It is hard, but not impossible, to get into the souks without a guide. On the road to Taroudant, in the typical Berber village of Asni, bartering is still practised at each Tuesday market (souk). We’ll practice our negotiating skill for some of the local handicrafts. Later, on the way to Ouirgane, we are reminded of the landscapes of American canyons. Breathtaking gorges lead to Imlil, a charming mountain hamlet. That is where most hikes would start to go through the Toubkal national park. 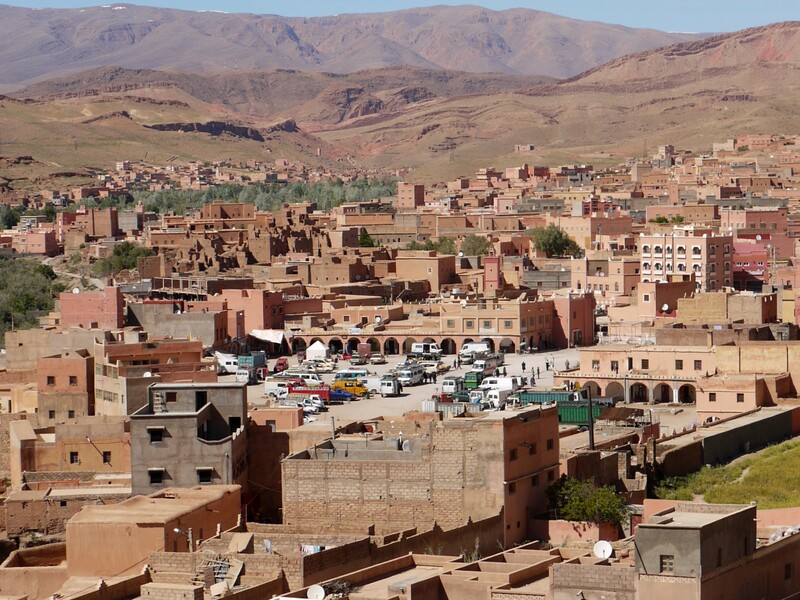 Ouarzazate is often referred to as a noiseless place! This is the exact translation of the Berber word “Ouarzazate”. Situated at the centre of a basin, the town rises up to a height of 1160 metres, one side facing the High Atlas (snow-covered 6 months out of a year), and the oasis on the other side. Ouarzazate was created by the French as a garrison and regional administrative centre in 1928. This morning we set out for a spectacular drive across the Atlas mountain range to Ouarzazate. The journey will take us over the Tizi n’Tichka Pass (2610m) and brings us superb views over the mountains and into the valleys along this drive. Stops are usually made in small villages on the edge of the road plus a stop at the Pass. The one main road goes via Taddert, one of the villages on the way. On arrival check-in at our selected hotel. Tonight’s dinner is at the hotel. Breakfast at your hotel before we make our drive through villages and the Todrah Gorges en route to Erfoud, the “door to the Sahara”. Almost one million palm trees grow in the Erfoud region, so it is not surprising that date should be its symbol. Modern day Erfoud stands at the spot where ancient Caravans travelling from north to south had their important trading market. Salt and agricultural goods were exchanged for ivory, gold and slaves from Black Africa. Erfoud maintains its roots as a central trading point in modern times. 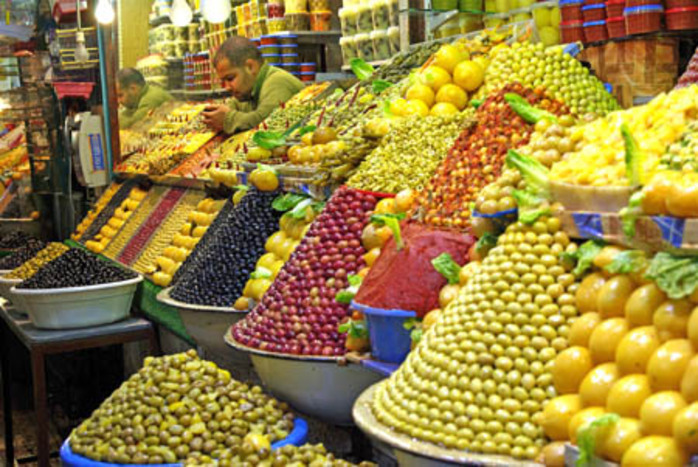 The main souk (market) sells olives, henna, mint and other produce grown in surrounding villages. But the jewel of the oasis is the date. Palm trees stretch far into the shimmering haze of the desert. Boasting the largest continuous oasis in the world, the Tafilalet region provides the bulk of Morocco’s date production. Symbolising the truth of the desert — that goodness and life can exist in such a harsh environment, the date holds an important place in the lives of desert dwellers. Rich in vitamins with a natural sweetness, this innocuous dried fruit and a cup of camel or goat milk represents life. Lunch en route at the Dades Gorges, before arriving to Erfoud during the mid-afternoon. For caravans, travelling from the north and south, the spot where modern day Erfoud stands became an important trading market. Salt and agricultural goods were exchanged for gold, ivory, and slaves from Black Africa. Two decorated archways standing in the ruins of 8th century Sijilmassa, 12 kilometres from Erfoud, shout to the desert winds of a time when the Tafilalet region was pivotal in the economic and political expansion of the emerging Moroccan kingdom. A Berber word meaning pack up and move on, Erfoud’s role as a commercial centre for the travelling merchants not only plying the north-south route but also pushing inland to the mountainous core of Morocco was enhanced by the potential of the fertile oases. Filali tribes exchanged camels for donkeys and began to settle between the sheer walls of the river Ksours (from the Arabic qasr — castle or palace), that turn a deep red in the evening sun, still hug the valley walls today. This morning we depart Erfoud travelling northwest through towns and villages on our drive to Fes with a few stops along the way. One of our highlights will be Er Rachidia, located in the Ziz Valley, and north of the Tafilalet Valley. Except for the majestic qasr, the city is well known for its pleasant atmosphere and high level of activity in the streets in the evenings, when all seem to join the crowd. (Women are returning home some hours before the men). The city’s best offer is its people and culture. Getting in contact with locals is easy and almost always highly rewarding. Then continue to Fes via Midelt (stopping for lunch), Azrou and Ifrane Late afternoon arrival in Fes for check-in at our hotel. The intellectual capital, the craft work capital, the most imperial of all cities in Morocco and the pearl of the Arab World, Fes is where the senses are given truly royal treatment. The Holy City of Fez is a jewel of Spanish-Arabic civilisation that not reveal its secrets easily. Secretive and shadowy, they need to be discovered little by little, and with reverence. 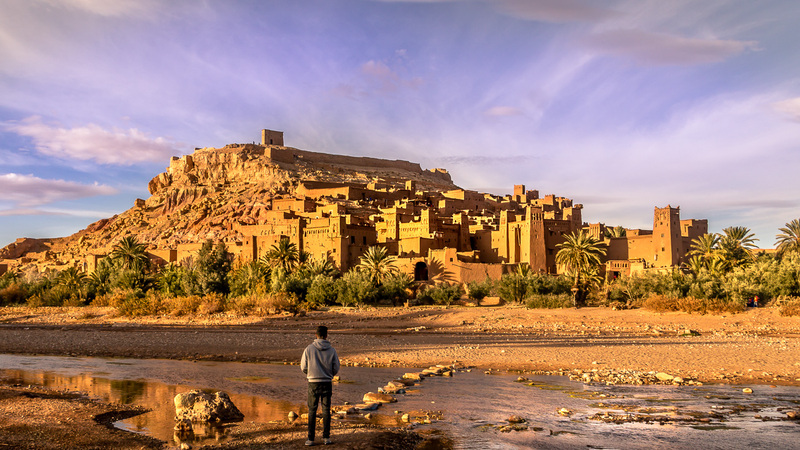 Once known as “the well-guarded,” Fez sits in the lap of two bare low hills and spills beyond its ramparts onto the wide and fertile plain that stretches south to the mountains of the Middle Atlas. Bustling with artisans and merchants, its captivating sounds, fragrances and colours mesmerise the visitor with a constant swirl of activity. On our agenda today is a full day city sightseeing of Fes, its monuments and its souks. We begin our exploration of this city of Moulay Idriss I, sanctuary of human and moral sciences. The great Qaraouiyne University has for eleven centuries been a religious and intellectual centre whose influence base spread far beyond the Kingdom’s boundaries. The Andalusian mosque, dating from the 9th century, and further embellished by successive rulers, is accessed through a mighty door of sculpted cedar. An imposing minaret decorated with green faience crowns the Rsif Mosque. The medersas around the Qaraouiyne Mosque, former lodging houses for students coming from outside the city, attest the importance of its thousand years of history. In the Medina, a labyrinth of sloping, winding alleyways are crammed full of stalls and workshops. A multitude of locally produced goods are on sale in this incredible maze-cotton fabric, silk, brocade work, slippers, and many more. Each district has its own speciality too! Leaving the souks through the Boujeloud gate, the riches contained in the wonderful Museum of Moroccan Art awaits. Our visit will include the tanners, Foundouk des tisserants, Medersa El Attarine, La Qaraouiyne, The Nejjarine Fountain, the souks (market) and a carpet co-operative. Stop at the Gate of Bab Boujeloud, the ancient ramparts and the front entrance to the Royal Palace. Full day excursion to Meknes. Although Meknes was a town of considerable size even in the days of the Merinides of the 13th Century, it wasn’t until the 17th Century that it experienced its heyday when, in 1672, Moulay Ismail made it his capital. The city had begun to crumble as a result of an earthquake in 1755 and subsequent neglect, but in recent years a lot of restoration work has been done. You will also see the gate of Bab El Mansour, the Moulay Ismail Stables and Dar El Beida. From the mausoleum, the road follows the walls of the Dar el-Makhzen (Moulay Ismail’s palace complex and now one of King Mohamed VI’s official residences) until you reach the Agdal, a grand artificial lake, and the spectacular Heri es-Souani granaries and stables. A forum, a Capitol, basilica, triumphal arch, oil presses, spas… the inhabitants led a life of luxury at Volubilis. 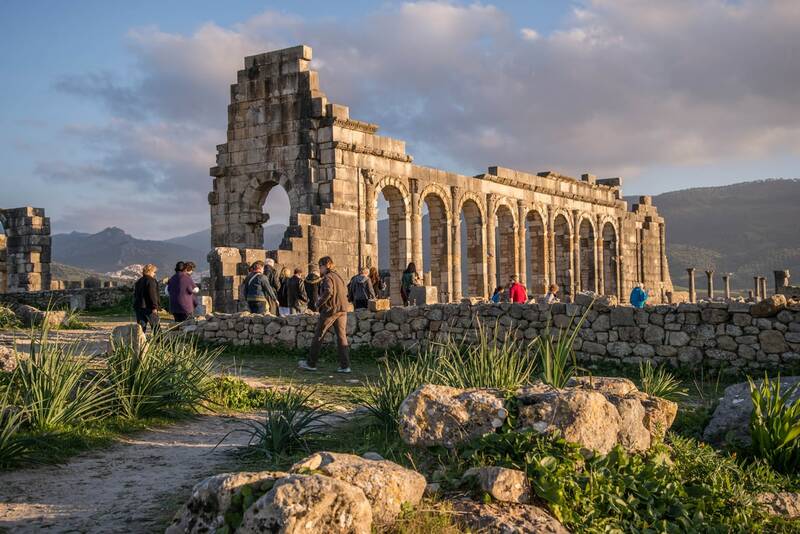 Dating back to pre-Roman times, Volubilis became one of the capitals of 1st Century Mauritania. It prospered thanks to a thriving trade in oil, corn and wild animals, and was endowed with magnificent buildings. Volubilis has slumbered in the Moroccan countryside for 2,000 years. This morning we set out on a spectacular drive to Tangiers, driving northwest through the beautiful Rif Mountains, one of the prettiest villages in Morocco. En-route to Tangiers, we will tour the blue and white painted village of Chaouen including the Place El Makhzen as well as the Medina. Chaouen was once settled by refugees fleeing the Christian conquest of the old kingdom of Granada. Lunch on own and time to explore more of Chaouen at your own pace. Late in the afternoon, we will continue to Tangiers via the small town of Tetouan, once a Spanish capital located on the Mediterranean Sea coast, but today it is a lively Berber town. Visit the Kasbah and Medina before continuing to Tangiers for check-in at the hotel. After breakfast, we will visit the King’s Palace and Cap Spartel (the area where the Atlantic and Mediterranean Oceans meet and Hercules Cave. Then we depart for Casablanca via Rabat. We will be travelling via the highway just outside of Tangiers. Nestling within the protection of the ochre-coloured ramparts, is this gleaming white city; the capital of Morocco and the setting for the Royal Palace of his Majesty Mohamed VI. It is the seat of the government, and of the ministries. Rabat has a long history as a capital city. In the 12th century, Yacoub El Mansour, the great Almohad conqueror chose it to be the symbol of his splendour. We will visit Hassan Tower, the Mohamed V Mausoleum and the Casbah of Oudayas. After a very early breakfast, we check-out and bid farewell to Morocco, where we are transferred to Casablanca Mohamed V airport in time to board the return flight to Canada. TICO # 1810380 | Copyright © 2018 Millenium Travel. All Rights Reserved.